Following the rules- | It's not a slow car, it's a fast house! As we departed the fertile valleys of Safford, Thatcher and Lebanon Arizona with our noses pointed towards Mexico we almost forgot to follow our own rules. We were happy to be on the road again, after the campout in the Auto Zone parking lot. We were ready to be on the sand, with the ocean nearby and our familiar old trailer as a home base. We drove through crazy-hard rain and took a short cut across the Tohono O’odam Indian Reservation to try to get to the border quickly. We would use this short cut to get to the border. We would finish the last hour from border to beach, just at nightfall. Arriving to our destination at dark. But as with so many plans, Mother Nature had another idea. She decided to offer up copious amounts of water to flow across the desert floor. This flow caused a BIA highway closure, just 45 miles short of our turn off for the border crossing. This meant several additional hours of driving to get around the flooding and back on track. But if we made it an 8 hour driving day AND drove that final stretch of Mexican highway well after dark- we could wake up on the beach! There are two ways to complete that sentence. Broken. Followed. We chose “……followed”. The first rule that we nearly broke was that of long days behind the wheel. Previously we had determined that a 4 to 6 hour driving day is about perfect. Our trip to Colorado reminded us of that. Any more hours than 6 and the driver is burned out, passengers are stir-crazy and decisions are not well-made. Yet, we were about to drive 8 hours in one long stretch, including the floodplain diversion. The second rule we nearly broke was in regards to night driving in Mexico. This one is a little tricky, because we are very familiar with this particular stretch of highway. We know every bump and turn and ejido along the way. But it is still a risky practice, and one that we should continue to avoid. Yet our desire to get to be beach was a strong calling. Truck stop breakfast= $8.00 per person for basic food items plus coffee. Hotel room= $50.00 for two persons including unlimited hot showers and free coffee, free breakfast, free wifi, free ice and no one cared about dogs in the room! 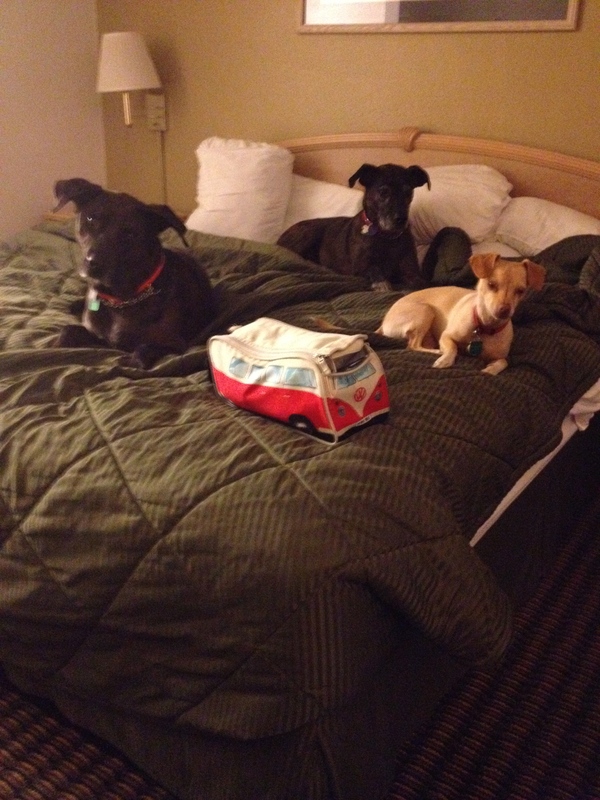 Dogs in the hotel room. A few showers. A big bed to hold all of us. Free breakfast. Free wifi. We spent the night in a mediocre highway hotel. We woke up rested, clean and ready to dash across the border in daylight hours and see what Puerto Penasco had going on. ← After “the adventure begins” solar power pulls us through! Terri- Many vehicles in Mexico do not have sufficient lighting to be visible from a distance (such as highway speeds) and there are often items to dodge such as trash, cows, dogs, stalled cars, etc on the highways. And if we are the ones with mechanical issues, a dark highway can be a scary place. It is just better to run the routes during daylight to increase safety. Smart to stay at the hotel, especially if they allowed pets! I take it, other than the obstacles in the road, the other reason to not drive in Mexico at night is because of safety reasons, right? I have heard that it’s not advisable for americans to do. The dogs get a vote, because they also get road weary, cranky and smelly! And as you can see, they really enjoyed the king sized bed. I knew that all my teacher friends would love the “rules” part of our plan! I need them to keep my bearings.